At the age of eighty, one of the most influential yet reclusive intellectuals of the twentieth century consented to his first interviews in nearly thirty years. Hailed by "Le Figaro" as "an event," the resulting conversations between Claude Levi-Strauss and Didier Eribon (a correspondent for "Le Nouvel Observateur") reveal the great anthropologist speaking of his life and work with ease and humor. 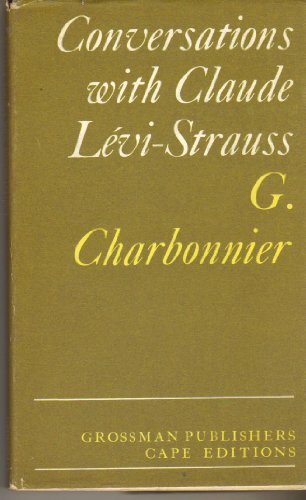 Now available in English, the conversations are rich in Levi-Strauss's candid appraisals of some of the best-known figures of the Parisian intelligentsia: surrealists Andre Breton and Max Ernst, with whom Levi-Strauss shared a bohemian life in 1940s Manhattan; de Beauvoir, Sartre, and Camus, the stars of existentialism; Leiris, Foucault, Dumezil, Jacob, Lacan, and others. His long friendships with Jakobson and Merleau-Ponty are recalled, as well as his encounters with prominent figures in American anthropology: Lowie, Boas (who suddenly died in his chair beside Levi-Strauss at a banquet at Columbia University), Benedict, Linton, Mead, and Kroeber. Levi-Strauss speaks frankly about how circumstances and his own inclinations, after his early fieldwork in Brazil, led him to embrace theoretical work. His straightforward answers to Eribon's penetrating questions--What is a myth? What is structuralism? Are you a philosopher?--clarify his intellectual motives and the development of his research; his influential role as an administrator, including the founding of the Laboratory of Social Anthropology and of the journal "L'Homme"; the course of his writings, from "Elementary Structures of Kinship "to "The Jealous Potter"; and his thoughts on the conduct of anthropology today. Never before has Levi-Strauss spoken so freely on so many aspects of his life: his initial failure to be elected to the College de France; his reaction to the events of May 1968; his regrets at not being a great investigative reporter or playwright; his deep identification with Wagner, Proust, and Rousseau. This is a rare opportunity to become acquainted with a great thinker in all his dimensions. Claude Levi-Strauss's many books include The Savage Mind; Structural Anthropology, volume 2; The Raw and the Cooked; From Honey to Ashes; The Origin of Table Manners; The Naked Man; and The Jealous Potter, all published by the University of Chicago Press."